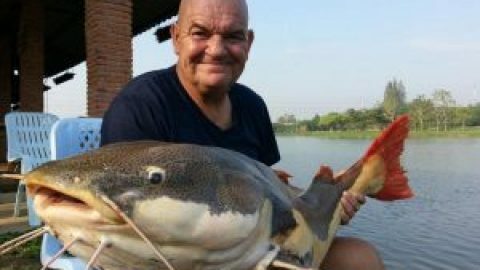 European angler Jarno and his friend continued their fishing holiday with a trip to Bungsamran Lake in Bangkok fishing for Mekong Catfish. After casting large balls of groundbait out into the centre of the lake the anglers waited for action to begin. It didn’t take long before one of the rods was away with a catfish ripping line form the reel. The fish fought well and was beaten after a short battle. The catfish was estimated at 20kg’s and quickly released in readiness for the next fish. Further casts resulted in Mekong Catfish of a similar size for both anglers. As the days fishing continued both anglers added more Mekong Catfish and Striped Catfish to their rapidly increasing haul. Later in the afternoon Jarno hooked a much better sized fish which proceeded to visit the other side of the lake on its initial run. After fighting it for almost twenty minutes the fish was finally netted and brought onto the fishing platform. 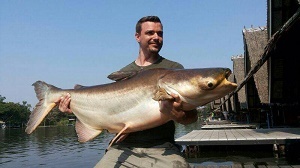 The Mekong Catfish was estimated to weigh 40kg’s and was released after photography.